The aggregate market value of the Ordinary Common Stock (“common stock”) held by non‑affiliates of the registrant based on the closing price on June 30, 2017 (the last business day of the registrant’s most recently completed second fiscal quarter) was approximately $1.7 billion. The number of shares of Magellan Health, Inc.’s common stock outstanding as of February 23, 2018 was 24,324,140. Portions of the definitive proxy statement for the 2017 Annual Meeting of Shareholders are incorporated by reference into Part III of this Form 10‑K. This Form 10‑K includes “forward‑looking statements” within the meaning of Section 27A of the Securities Act of 1933, as amended (the “Securities Act”), and Section 21E of the Securities Exchange Act of 1934, as amended (the “Exchange Act”). Examples of forward‑looking statements include, but are not limited to, statements the Company (as defined below) makes regarding our future operating results and liquidity needs. Although the Company believes that its plans, intentions and expectations reflected in such forward‑looking statements are reasonable, it can give no assurance that such plans, intentions or expectations will be achieved. Prospective investors are cautioned that any such forward‑looking statements are not guarantees of future performance and involve risks and uncertainties, and that actual results may differ materially from those contemplated by such forward‑looking statements. Important factors currently known to management that could cause actual results to differ materially from those in forward‑looking statements are set forth under the heading “Risk Factors” in Item 1A and elsewhere in this Form 10‑K. When used in this Form 10‑K, the words “estimate,” “anticipate,” “expect,” “believe,” “should” and similar expressions are intended to be forward‑looking statements. Any forward‑looking statement made by the Company in this Form 10‑K speaks only as of the date on which it is made. Factors or events that could cause our actual results to differ may emerge from time to time, and it is not possible for the Company to predict all of them. The Company undertakes no obligation to publicly update any forward‑looking statement, whether as a result of new information, future developments or otherwise, except as may be required by law. You should also be aware that while the Company from time to time communicates with securities analysts, the Company does not disclose to them any material non‑public information, internal forecasts or other confidential business information. Therefore, to the extent that reports issued by securities analysts contain projections, forecasts or opinions, those reports are not the Company’s responsibility and are not endorsed by the Company. You should not assume that the Company agrees with any statement or report issued by any analyst, irrespective of the content of the statement or report. Magellan Health, Inc. (“Magellan”) is a leader within the healthcare management business, and is focused on delivering innovative specialty solutions for the fastest growing, most complex areas of health, including special populations, complete pharmacy benefits, and other specialty carve-out areas of healthcare. The Company develops innovative solutions that combine advanced analytics, agile technology and clinical excellence to drive better decision making, positively impact members’ health outcomes and optimize the cost of care for the customers we serve. The Company provides services to health plans and other managed care organizations (“MCOs”), employers, labor unions, various military and governmental agencies and third party administrators (“TPAs”). Magellan operates three segments: Healthcare, Pharmacy Management and Corporate. In this report, references to the “Company” include Magellan and its subsidiaries. Magellan was incorporated in 1969 under the laws of the State of Delaware. The Healthcare segment (“Healthcare”) is broken down into two reporting units – Commercial and Government. The Commercial reporting unit’s customers include health plans, accountable care organizations (“ACOs”), and employers for whom Magellan provides carve-out management services for behavioral health, employee assistance plans (“EAP”), and other areas of specialty healthcare including diagnostic imaging, musculoskeletal management, cardiac, and physical medicine. These management services are applied to a health plan’s or ACO’s entire book of business including commercial, Medicaid and Medicare members or targeted complex populations basis. serious mental illness (“SMI”), dual eligibles, aged, blind and disabled (“ABD”) and other populations with unique and often complex healthcare needs. The Pharmacy Management segment (“Pharmacy Management”) is comprised of products and solutions that provide clinical and financial management of pharmaceuticals paid under both the medical and the pharmacy benefit. Pharmacy Management’s services include: (i) pharmacy benefit management (“PBM”) services; (ii) pharmacy benefit administration (“PBA”) for state Medicaid and other government sponsored programs; (iii) pharmaceutical dispensing operations; (iv) clinical and formulary management programs; (v) medical pharmacy management programs; and (vi) programs for the integrated management of specialty drugs across both the medical and pharmacy benefit that treat complex conditions, regardless of site of service, method of delivery, or benefit reimbursement. See Note 10—“Business Segment Information” to the consolidated financial statements for certain segment financial data relating to our business set forth elsewhere herein. In recent years, the Company has expanded its Healthcare segment with various acquisitions. The acquisitions of AlphaCare Holdings, Inc. (“AlphaCare Holdings”) in 2013, The Management Group, LLC (“TMG”) in 2016, Armed Forces Services Corporation (“AFSC”) in 2016 and SWH Holdings, Inc. (“SWH”) in 2017 expanded the Company’s government reporting unit. In recent years, the Company has expanded its Pharmacy Management segment with various acquisitions. The acquisitions of Partners Rx Management, LLC (“Partners Rx”) in 2013, 4D Pharmacy Management Systems, Inc. (“4D”) in 2015 and Veridicus Holdings, LLC (“Veridicus”) in 2016 expanded the Company’s presence in the PBM market. The Company expanded its formulary management programs with the acquisition of CDMI, LLC (“CDMI”) in 2014. According to the Centers for Medicare and Medicaid Services (“CMS”), total U.S. healthcare spending was projected to have increased 5.4 percent to nearly $3.5 trillion in 2017, representing approximately 18.3 percent of the gross domestic product. With the uncertain economic environment, rising healthcare costs, increased fiscal pressures on federal and state governments and the uncertainty around the full implementation of healthcare reform, healthcare spending will continue to be one of the greatest pressing issues for the American public and government agencies. The rapidly evolving clinical and technological environment demands the expertise of specialized healthcare management services to provide both high‑quality and affordable care. Expanding integrated management services provided to special populations through Magellan Complete Care. The Company, through Magellan Complete Care, will grow the clinically integrated management of complex special populations. Magellan believes its significant Medicaid, behavioral health and pharmacy experience will enable it to further develop and market programs to manage these special populations, utilizing the Company’s unique expertise to improve health outcomes for members served and lower costs for our customers. The Company continues to invest in special population management capabilities and may enter into partnerships, joint ventures or acquisitions that facilitate this effort. Continuous innovation and opportunistic expansion upon the current suite of carve-out management services for our Commercial Healthcare customers. Magellan will continue to be a consultative partner with our customers to provide quality outcomes and appropriate care by leveraging our clinical expertise, provider networks, claims and customer service. Expanding the Pharmacy Management business with continued focus on specialty drugs. With advances in specialty drugs driving the majority of pharmaceutical cost increases, our foundation as an industry leader in specialty drug management uniquely positions us to deliver programs across all aspects of drug spend – traditional drugs, as well as specialty drugs paid under both the medical and pharmacy benefits. Our value based strategies are designed to support the 2-3% of patients driving the majority of spend through advanced analytics, high-touch clinical programs and comprehensive specialty drug solutions centered around complex conditions. The Company’s pharmacy management programs seek to grow through both new customer acquisition and expansion of services to existing customers. We seek to continue growing our comprehensive PBM client base. In addition, we will leverage our specialty drug management expertise to grow our carve-out pharmacy programs, including formulary management and medical pharmacy, targeting health plans and employers. We also remain focused on retention and expansion of state Medicaid PBA business. The Company provides behavioral healthcare management and other related services to members in the state of Florida pursuant to contracts with the State of Florida (the “Florida Contracts”). The Florida Contracts generated net revenues that exceeded, in aggregate, ten percent of net revenues for the consolidated Company for the years ended December 31, 2016 and 2017, respectively. The Company also has significant concentrations of business with various counties in the State of Pennsylvania (the “Pennsylvania Counties”) which are part of the Pennsylvania Medicaid Program, with members under its contract with CMS, and with various agencies and departments of the United States federal government. See further discussion related to these significant customers in “Risk Factors—Reliance on Customer Contracts.” In addition, see “Risk Factors—Dependence on Government Spending” for discussion of risks to the Company related to government contracts. The Company’s managed behavioral healthcare services, integrated healthcare services and EAP treatment services are provided by a contracted network of third‑party providers, including physicians, psychiatrists, psychologists, other behavioral and physical health professionals, psychiatric hospitals, general medical facilities with psychiatric beds, residential treatment centers and other treatment facilities. The number and type of providers in a particular area depend upon customer preference, site, geographic concentration and demographic composition of the beneficiary population in that area. The Company’s network consists of approximately 190,000 healthcare providers, including facility locations, providing various levels of care nationwide. The Company’s network providers are almost exclusively independent contractors located throughout the local areas in which the Company’s customers’ beneficiary populations reside. Outpatient network providers work out of their own offices, although the Company’s personnel are available to assist them with consultation and other needs. Non‑facility network providers include both individual practitioners, as well as individuals who are members of group practices or other licensed centers or programs. Non‑facility network providers typically execute standard contracts with the Company under which they are generally paid on a fee‑for‑service basis. Third‑party network facilities include inpatient psychiatric and substance abuse hospitals, intensive outpatient facilities, partial hospitalization facilities, community health centers and other community‑based facilities, rehabilitative and support facilities and other intermediate care and alternative care facilities or programs. This variety of facilities enables the Company to offer patients a full continuum of care and to refer patients to the most appropriate facility or program within that continuum. Typically, the Company contracts with facilities on a per diem or fee‑for‑service basis and, in some limited cases, on a “case rate” or capitated basis. The contracts between the Company and inpatient and other facilities typically are for one‑year terms and are terminable by the Company or the facility upon 30 to 120 days notice. The Company’s radiology benefits management (“RBM”) services are provided by a network of providers including diagnostic imaging centers, radiology departments of hospitals that provide advanced imaging services on an outpatient basis, and individual physicians or physician groups that own advanced imaging equipment and specialize in certain specific areas of care. Certain providers belong to the Company’s network, while others are members of networks belonging to the Company’s customers. These providers are paid on a fee‑for‑service basis. The Company also has a national network of contracted retail pharmacies which is offered to its pharmacy benefit management customers. We contract with and manage these pharmacies to optimize drug cost and member access to fill covered prescriptions. Pharmacies can work with us both electronically and telephonically at the point of service for member eligibility, claim adjudication and member cost share, if applicable. The Company’s business is highly competitive. The Company competes with other healthcare organizations as well as with insurance companies, including health maintenance organizations (“HMOs”), preferred provider organizations (“PPOs”), TPAs, independent practitioner associations (“IPAs”), multi‑disciplinary medical groups, PBMs, healthcare information technology companies, and other specialty healthcare and managed care companies. Many of the Company’s competitors, particularly certain insurance companies, HMOs, technology companies, and PBMs are significantly larger and have greater financial, marketing and other resources than the Company, and some of the Company’s competitors provide a broader range of services. The Company competes based upon quality and reliability of its services, a focus on clinical excellence, product and service innovation and proven expertise across its business lines. The Company may also encounter competition in the future from new market entrants. In addition, some of the Company’s customers that are managed care companies may seek to provide specialty managed healthcare services directly to their subscribers, rather than by contracting with the Company for such services. Because of these factors, the Company does not expect to be able to rely to a significant degree on price increases to achieve revenue growth, and expects to continue experiencing pricing pressures. The Company maintains a program of insurance coverage for a broad range of risks in its business. The Company has renewed its general, professional and managed care liability insurance policies with unaffiliated insurers for a one‑year period from June 17, 2017 to June 17, 2018. The general liability policy is written on an “occurrence” basis, subject to a $0.05 million per claim un‑aggregated self‑insured retention. The professional liability and managed care errors and omissions liability policies are written on a “claims‑made” basis, subject to a $1.0 million per claim ($10.0 million per class action claim) un‑aggregated self‑insured retention for managed care errors and omissions liability, and a $0.05 million per claim un‑aggregated self‑insured retention for professional liability. The Company maintains a separate general and professional liability insurance policy with an unaffiliated insurer for its specialty pharmaceutical dispensing operations. The specialty pharmaceutical dispensing operations insurance policy has a one‑year term for the period June 17, 2017 to June 17, 2018. The general liability policy is written on an “occurrence” basis and the professional liability policy is written on a “claims‑made” basis, subject to a $0.05 million per claim and $0.25 million aggregated self‑insured retention. The Company is responsible for claims within its self‑insured retentions, and for portions of claims reported after the expiration date of the policies if they are not renewed, or if policy limits are exceeded. The Company also purchases excess liability coverage in an amount that management believes to be reasonable for the size and profile of the organization. See “Risk Factors—Professional Liability and Other Insurance,” for a discussion of the risks associated with the Company’s insurance coverage. The Company’s operations are subject to extensive and evolving state and federal laws and regulation in the jurisdictions in which we do business. This includes applicable federal and state laws and regulations in connection with its role in providing pharmacy benefit management; behavioral health benefit management; radiology benefit management; utilization review; customer employee benefit plan services; pharmacy; healthcare services; Medicaid; Medicare; health insurance, and laws and regulations impacting its federal government contracts. Regulation of the healthcare industry as well as government contracting is constantly evolving, with new legislative enactments and regulatory initiatives at the state and federal levels being implemented on a regular basis. Consequently, it is possible that a court or regulatory agency may take a position under existing or future laws or regulations, or as a result of a change in the interpretation thereof that such laws or regulations apply to the Company in a different manner than the Company believes such laws or regulations apply. In addition, existing laws and regulations may be repealed or modified. Such changes may require significant alterations to the Company’s business operations in order to comply with such laws or regulations, or interpretations thereof. Expansion of the Company’s business to cover additional geographic areas, to serve different types of customers, to provide new services or to commence new operations could also subject the Company to additional licensure requirements and/or regulation. Failure to comply with applicable regulatory requirements could have a material adverse effect on the Company. The Company is subject to certain state laws and regulations governing the licensing of insurance companies, HMOs, PPOs, TPAs, PBMs, pharmacies and companies engaged in utilization review. In addition, the Company is subject to state laws and regulations concerning the licensing of healthcare professionals, including restrictions on business corporations from providing, controlling or exercising excessive influence over healthcare services through the direct employment of physicians, psychiatrists or, in certain states, psychologists and other healthcare professionals. These laws and regulations vary considerably among states, and the Company may be subject to different types of laws and regulations depending on the specific regulatory approach adopted by each state to regulate the managed care and pharmaceutical management businesses and the provision of healthcare treatment services. Further, certain regulatory agencies having jurisdiction over the Company possess discretionary powers when issuing or renewing licenses or granting approval of proposed actions such as mergers, a change in ownership, and certain intra‑corporate transactions. One or multiple agencies may require as a condition of such license or approval that the Company cease or modify certain of its operations or modify the way it operates in order to comply with applicable regulatory requirements or policies. In addition, the time necessary to obtain a license or approval varies from state to state, and difficulties in obtaining a necessary license or approval may result in delays in the Company’s plans to expand operations in a particular state and, in some cases, lost business opportunities. The Company has sought and obtained licenses as a utilization review agent, single service HMO, TPA, PBM, Pharmacy, PPO, HMO and Health Insurance Company in one or more jurisdictions. Numerous states in which the Company does business have adopted regulations governing entities engaging in utilization review. Utilization review regulations typically impose requirements with respect to the qualifications of personnel reviewing proposed treatment, timeliness and notice of the review of proposed treatment and other matters. Many states also license TPA activities. These regulations typically impose requirements regarding claims processing and payments and the handling of customer funds. Some states require TPA licensure for PBM entities as a way to regulate the PBM lines of business. Other states regulate PBMs through a PBM specific license. The Company has obtained these licenses as required to support the PBM business. Certain insurance licenses are required for the Company to pursue Medicare Part D business; this is discussed further in the pharmacy section of this document. In some cases, single purpose HMO licenses are required for the Company to take risk on business in that state. Some states require PPO or other network licenses to offer a network of providers in the state. Almost all states require licensure for pharmacies dispensing or shipping medications into the state. The Company has obtained all of these necessary licenses. To the extent that the Company operates or is deemed to operate in some states as an insurance company, HMO, PPO or similar entity, it may be required to comply with certain laws and regulations that, among other things, may require the Company to maintain certain types of assets and minimum levels of deposits, capital, surplus, reserves or net worth. Being licensed as an insurance company, HMO or similar entity could also subject the Company to regulations governing reporting and disclosure, coverage, mandated benefits, rate setting, grievances and appeals, prompt pay laws and other traditional insurance regulatory requirements. Regulators in a few states have adopted policies that require HMOs or, in some instances, insurance companies, to contract directly with licensed healthcare providers, entities or provider groups, such as IPAs, for the provision of treatment services, rather than with unlicensed intermediary companies. In such states, the Company’s customary model of contracting directly is modified so that, for example, the IPAs (rather than the Company) contract directly with the HMO or insurance company, as appropriate, for the provision of treatment services. The National Association of Insurance Commissioners (“NAIC”) has developed a “health organizations risk‑based capital” formula, designed specifically for managed care organizations, that establishes a minimum amount of capital necessary for a managed care organization to support its overall operations, allowing consideration for the organization’s size and risk profile. The NAIC also adopted a model regulation in the area of health plan standards, which could be adopted by individual states in whole or in part, and could result in the Company being required to meet additional or new standards in connection with its existing operations. Certain states, for example, have adopted regulations based on the NAIC initiative, and as a result, the Company has been subject to certain minimum capital requirements in those states. Certain other states, such as Maryland, Texas, New York, Florida and New Jersey, have also adopted their own regulatory initiatives that subject entities, such as certain of the Company’s subsidiaries, to regulation under state insurance laws. This includes, but is not limited to, requiring adherence to specific financial solvency standards. State insurance laws and regulations may limit the Company’s ability to pay dividends, make certain investments and repay certain indebtedness. Regulators may impose operational restrictions on entities granted licenses to operate as insurance companies or HMOs. For example, the California Department of Managed Health Care has imposed certain restrictions on the ability of the Company’s California subsidiaries to fund the Company’s operations in other states, to guarantee or cosign for the Company’s financial obligations, or to pledge or hypothecate the stock of these subsidiaries and on the Company’s ability to make certain operational changes with respect to these subsidiaries. In addition, regulators of certain of the Company’s subsidiaries may exercise certain discretionary rights under regulations including, without limitation, increasing its supervision of such entities or requiring additional restricted cash or other security. Failure to obtain and maintain required licenses typically also constitutes an event of default under the Company’s contracts with its customers. The loss of business from one or more of the Company’s major customers as a result of an event of default or otherwise could have a material adverse effect on the Company. Licensure requirements may increase the Company’s cost of doing business in the event that compliance requires the Company to retain additional personnel to meet the regulatory requirements and to take other required actions and make necessary filings. Although compliance with licensure regulations has not had a material adverse effect on the Company, there can be no assurance that specific laws or regulations adopted in the future would not have such a result. The provision of healthcare treatment services by physicians, psychiatrists, psychologists, pharmacists and other providers is subject to state regulation with respect to the licensing of healthcare professionals. The Company believes that the healthcare professionals, who provide healthcare treatment on behalf of or under contracts with the Company, and the case managers and other personnel of the health services business, are in compliance with the applicable state licensing requirements and current interpretations thereof. Regulations imposed upon healthcare providers include but are not limited to, provisions relating to the conduct of, and ethical considerations involved in, the practice of medicine, psychiatry, psychology, social work and related behavioral healthcare professions, radiology, pharmacy, privacy, accreditation, government healthcare program participation requirements, reimbursements for patient services, Medicare, Medicaid, federal and state laws governing fraud, waste and abuse and, in certain cases, the common law or statutory duty to warn others of danger or to prevent patient self‑injury or the statutory duties to report matters of abuse or neglect of individuals. However, there can be no assurance that changes in such requirements or interpretations thereof will not adversely affect the Company’s existing operations or limit expansion. In California, the Company’s employee assistance programs are regulated by the California Department of Managed Health Care. This subjects the Company to regulations governing reporting and disclosure, coverage, mandated benefits, grievances and appeals and other traditional insurance regulatory requirements. With respect to the Company’s employee assistance crisis intervention program, additional licensing of clinicians who provide telephonic assessment or stabilization services to individuals who are calling from out‑of‑state may be required if such assessment or stabilization services are deemed by regulatory agencies to be treatment provided in the state of such individual’s residence. The Company believes that any such additional licenses could be obtained. The laws of some states limit the ability of a business corporation to directly provide, control or exercise excessive influence over healthcare services through the direct employment of physicians, psychiatrists, psychologists, or other healthcare professionals, who are providing direct clinical services. In addition, the laws of some states prohibit physicians, psychiatrists, psychologists, or other healthcare professionals from splitting fees with other persons or entities. These laws and their interpretations vary from state to state and enforcement by the courts and regulatory authorities may vary from state to state and may change over time. There can be no assurance that the Company’s existing operations and its contractual arrangements with physicians, psychiatrists, psychologists and other healthcare professionals will not be successfully challenged under state laws prohibiting fee splitting or the practice of a profession by an unlicensed entity, or that the enforceability of such contractual arrangements will not be limited. The Company believes that it could, if necessary, restructure its operations to comply with changes in the interpretation or enforcement of such laws and regulations, and that such restructuring would not have a material adverse effect on its operations. The Company has a group practice providing case management services to certain customers. The clinicians in the practice are licensed where they are practicing. Certain of the Company’s services are subject to the provisions of ERISA. ERISA governs certain aspects of the relationship between employer‑sponsored healthcare benefit plans and certain providers of services to such plans through a series of complex laws and regulations that are subject to periodic interpretation by the Internal Revenue Service (“IRS”) and the U.S. Department of Labor (“DOL”). In some circumstances, and under certain customer contracts, the Company may be expressly named as a “fiduciary” under ERISA, or be deemed to have assumed duties that make it an ERISA fiduciary, and thus be required to carry out its operations in a manner that complies with ERISA in all material respects. In other circumstances, particularly in the administration of pharmacy benefits, the Company does not believe that its services are subject to the fiduciary obligations and requirements of ERISA. In addition, the DOL has not yet finalized guidance regarding whether discounts and other forms of remuneration from pharmaceutical manufacturers are required to be reported to ERISA‑governed plans in connection with ERISA reporting requirements. Numerous states require the licensing or certification of entities performing TPA activities; however, certain federal courts have held that such licensing requirements are preempted by ERISA. ERISA preempts state laws that mandate employee benefit structures or their administration, as well as those that provide alternative enforcement mechanisms. The Company believes that its TPA activities performed for its self‑insured employee benefit plan customers are exempt from otherwise applicable state licensing or registration requirements based upon federal preemption under ERISA and have relied on this general principle in determining not to seek licenses for certain of the Company’s activities in some states. Existing case law is not uniform on the applicability of ERISA preemption with respect to state regulation of PBM or TPA activities. In some states, the Company has licensed its self‑funded pharmacy related business as a TPA or PBM after a review of state regulatory requirements and case law. There can be no assurance that additional licenses will not be required with respect to utilization review or TPA activities in certain states. Some of the state regulatory requirements described herein may be preempted in whole or in part by ERISA, which provides for comprehensive federal regulation of employee benefit plans. However, the scope of ERISA preemption is uncertain and is subject to conflicting court rulings. As a result, the Company could be subject to overlapping federal and state regulatory requirements with respect to certain of its operations and may need to implement compliance programs that satisfy multiple regulatory regimes. There can be no assurance that continuing ERISA compliance efforts or any future changes to ERISA will not have a material adverse effect on the Company. HIPAA promulgated standards relating to the transmission, privacy and security of health information by healthcare providers and healthcare plans. Confidentiality and patient privacy requirements are particularly strict in the Company’s behavioral managed care business. The Health Information Technology for Economic and Clinical Health Act (“HITECH Act”), passed as part of the American Recovery and Reinvestment Act of 2009, represented a significant expansion of the HIPAA privacy and security laws. HIPAA generally does not preempt state law. Therefore, because many states have privacy laws that either provide more stringent privacy protections than those imposed by HIPAA, the Company must address privacy issues under those state laws as well. In addition to HIPAA and the HITECH Act, the Company is also subject to federal laws and regulations governing patient records involving substance abuse treatment, as well as other federal privacy laws and regulations. There can be no assurance that compliance with such future laws and regulations would not have a material adverse effect on its operations. The Company is subject to federal and state laws and regulations protecting against fraud, waste and abuse. Fraud, waste and abuse prohibitions cover a wide range of activities, including kickbacks and other inducements for referral of members or the coverage of products, billing for unnecessary services by a healthcare provider and improper marketing. Companies involved in public healthcare programs such as Medicare and Medicaid are required to maintain compliance programs to detect and deter fraud, waste and abuse, and are often subject to audits. The regulations and contractual requirements applicable to the Company in relation to these programs are complex and subject to change. The federal healthcare Anti‑Kickback Statute (the “Anti‑Kickback Statute”) prohibits, among other things, an entity from paying or receiving, subject to certain exceptions and “safe harbors,” any remuneration, directly or indirectly, to induce the referral of individuals covered by federally funded healthcare programs, or the purchase, or the arranging for or recommending of the purchase, of items or services for which payment may be made in whole, or in part, under Medicare, Medicaid, TRICARE or other federally funded healthcare programs. Sanctions for violating the Anti‑Kickback Statute may include imprisonment, criminal and civil fines and exclusion from participation in the federally funded healthcare programs. The Anti‑Kickback Statute has been interpreted broadly by courts, the Office of Inspector General (“OIG”), the Department of Health and Human Services (“DHHS”) and other administrative bodies. It also is a crime under the Public Contracts Anti‑Kickback Statute, for any person to knowingly and willfully offer or provide any remuneration to a prime contractor to the United States, including a contractor servicing federally funded health programs, in order to obtain favorable treatment in a subcontract. Violators of this law also may be subject to civil monetary penalties. There have been a series of substantial civil and criminal investigations and settlements, at the state and federal level, by pharmacy benefit managers over the last several years in connection with alleged kickback schemes. The federal civil monetary penalty (“CMP”) statute provides for civil monetary penalties for any person who provides something of value to a beneficiary covered under a federal healthcare program, such as Medicare or Medicaid, in order to influence the beneficiary’s choice of a provider. ERISA, to which certain of our customers’ services are subject, generally prohibits any person from providing to a plan fiduciary a remuneration in order to affect the fiduciary’s selection of or decisions with respect to service providers. Unlike the federal healthcare Anti‑Kickback Statute, ERISA regulations do not provide specific safe harbors and its application may be unclear. The Federal Civil False Claims Act imposes civil penalties for knowingly making or causing to be made false claims with respect to governmental programs, such as Medicare and Medicaid, for services not rendered, or for misrepresenting actual services rendered, in order to obtain higher reimbursement. Private individuals may bring qui tam or whistleblower suits under the Federal Civil False Claims Act, which authorizes the payment of a portion of any recovery to the individual bringing suit. Further, pursuant to the Patient Protection and Affordable Care Act (“ACA”), a violation of the Anti‑Kickback Statute is also a per se violation of the Federal Civil False Claims Act. The Federal Civil False Claims Act generally provides for the imposition of civil penalties and for treble damages, resulting in the possibility of substantial financial penalties for small billing discrepancies. Criminal provisions that are similar to the Federal Civil False Claims Act provide that a corporation may be fined if it is convicted of presenting to any federal agency a claim or making a statement that it knows to be false, fictitious or fraudulent. Even in situations where the Company does not directly provide services to beneficiaries of federally funded health programs and, accordingly, does not directly submit claims to the federal government, it is possible that the Company could nevertheless become involved in a situation where false claim issues are raised based on allegations that it caused or assisted a government contractor in making a false claim. The Company is subject to certain provisions of the Deficit Reduction Act of 2005 (the “Act”). The Act requires entities that receive $5 million or more in annual Medicaid payments to establish written policies that provide detailed information about the Federal Civil False Claims Act and the remedies thereunder, as well as any state laws pertaining to civil or criminal penalties for false claims and statements, the “whistleblower” protections afforded under such laws, and the role of such laws in preventing and detecting fraud, waste and abuse. The Company is also subject to The Dodd‑Frank Wall Street Reform and Consumer Protection Act (“Dodd‑Frank”). Under the law, those with independent knowledge of a financial fraud committed by a business required to report to the U.S. Securities and Exchange Commission (“SEC”) or the U.S. Commodity Futures Trading Commission (“CFTC”) may be entitled to a percentage of the money recovered. Included in Dodd‑Frank are provisions which protect employees of publicly traded companies from retaliation for reporting securities fraud, fraud against shareholders and violation of the SEC rules/regulations. Dodd‑Frank also amends the Sarbanes‑Oxley Act (“SOX”) and Federal Civil False Claims Act to expand their whistleblower protections. Many states have laws and/or regulations similar to the federal fraud, waste and abuse laws described above. Sanctions for violating these laws may include injunction, imprisonment, criminal and civil fines and exclusion from participation in the state Medicaid programs. The Company has a corporate compliance and ethics program, policies and procedures and internal controls in place designed to ensure that the Company conducts business appropriately. However, there can be no assurance that the Company will not be subject to scrutiny or challenge under such laws or regulations and that any such challenge would not have a material adverse effect on the Company’s business, results of operations, financial condition or cash flows. The Paul Wellstone and Pete Domenici Mental Health Parity Act of 2008 (“MHPAEA”) establishes parity in financial requirements (e.g., co‑pays, deductibles, etc.) and treatment limitations (e.g., limits on the number of visits) between mental health and substance abuse benefits and medical/surgical benefits for health plan members. This law does not require coverage for mental health or substance abuse disorders, but if coverage is provided it must be provided at parity. No specific disorders are mandated for coverage; health plans are able to define mental health and substance abuse to determine what they are going to cover. Under the ACA, non‑grandfathered individual and small group plans (both on and off of the Health Insurance Exchange) are required to provide mental health and substance abuse disorder benefits as essential health benefits. These mandated benefits under the ACA must be provided at parity in these plans. Under the ACA, grandfathered individual plans are required to comply with parity if they offer behavioral health benefits. Grandfathered small group plans are exempt from requirements to provide essential health benefits and parity requirements. State mandated benefits laws are not preempted. The law applies to ERISA plans, Medicaid managed care plans and State Children’s Health Insurance Program (“SCHIP”) plans. On November 13, 2013 the Department of the Treasury, the Department of Labor and the Department of Health and Human Services issued Final Rules on the MHPAEA (“Final Rules”). The Final Rules include some concepts not included under the statute including the requirement to conduct the parity review at the category level within the plan, introducing the concept of non‑quantitative treatment limitations, and prohibiting separate but equal deductibles. The Company believes it is in compliance with these requirements. In March 2016, CMS promulgated a final rule on the application of parity to Medicaid Managed Care Plans, CHIP, and alternative benefit plans. Compliance with this rule was required on or after October 2, 2017. The Company has been working with our state Medicaid customers on compliance with these rules. On December 7, 2016, the Congress adopted the Twenty-First Century Cures Act, which codified some concepts in the Final Rules. The Company’s risk contracts allow for repricing to occur effective the same date that any legislation/regulation becomes effective if that legislation/regulation is projected to have a material effect on cost of care. The ACA is a broad and sweeping piece of legislation creating numerous changes in the healthcare regulatory environment. Some of the regulations interpreting the ACA, most notably the Medical Loss Ratio regulations, the Internal Claims and Appeals and External Review Processes Regulations, and Health Insurance Exchanges have an impact on the Company and its business. Others, such as the regulation on dependent coverage to age 26 and coverage of preventative health services, could impact the nature of the members that we serve and the utilization rates. Medicaid expansion under the ACA has had some impact on the Company’s Medicaid business. The Company has customers that are participating in the state and federal Health Insurance Exchanges. The Company has taken necessary steps to support our customers in their administration of these plans. The ACA also contains provisions related to fees that impact the Company’s direct public sector contracts and provisions regarding the non‑deductibility of those fees. Our state public sector customers have made rate adjustments to cover the direct costs of these fees and a majority of the impact from non‑deductibility of such fees for federal income tax purposes. There may be some impact due to taxes paid for non‑renewing customers where the timing and amount of recoupment of these additional costs is uncertain. There can be no guarantees regarding this adjustment from our state public sector customers and these taxes and fees may have a material impact on the Company. The Company directly contracts with various states to provide Medicaid services to states. In addition, the Company directly contracts with various states to provide Medicaid managed care services to state Medicaid beneficiaries. As such, it is subject to certain federal and state laws and regulations affecting Medicaid as well as state contractual requirements. In addition to state regulation, certain Medicaid contracts require the Company to maintain Medicare Advantage special needs plan status, which is regulated by CMS. The Company also is a sub‑contractor to health plans that provide Medicaid managed care services to state Medicaid beneficiaries. In the Company’s capacity as a subcontractor with these health plans, the Company is indirectly subject to certain federal and state laws and regulations as well as contractual requirements pertaining to the operation of this business. If a state or a health plan customer determines that the Company has not performed satisfactorily as a subcontractor, the state or the health plan customer may require the Company to cease these activities or responsibilities under the subcontract. While the Company believes that it provides satisfactory levels of service under its respective subcontracts, the Company can give no assurances that a state or health plan will not terminate the Company’s business relationships insofar as they pertain to these services. On May 6, 2016, CMS published final regulations that significantly modified the existing federal Medicaid Managed Care and the SCHIP regulations. On June 30, 2017, CMS issued an Informational Bulletin regarding the applicable effective/compliance dates for the new Medicaid Managed Care and the SCHIP regulations. Magellan is working respectively with state Medicaid agencies and Medicaid Managed Care Plans (our Medicaid customers) to ensure ongoing compliance with those sections of the regulations that are specified as effective based on the determination made by the applicable state Medicaid agency. In connection with its PBM business, the Company negotiates rebates with and provides services for drug manufacturers. The manufacturers are subject to Medicaid “best price” regulations requiring essentially that the manufacturer provide its deepest level of discounts to the Medicaid program. In some instances, the government has challenged a manufacturer’s calculation of best price and we cannot be certain what effect, if any, the outcome of any such investigation or proceeding will have on our ability to negotiate favorable terms. The Company is contracted with CMS as a Medicare Advantage Organization (“MAO”) and Prescription Drug Plan (“PDP”) to provide health services and prescription drug benefits to Medicare beneficiaries. The regulations and contractual requirements applicable to the Company and other participants in Medicare programs are complex and subject to change. CMS regularly audits its contractors’ performance to determine compliance with contracts and CMS regulations, and to assess the quality of services provided to Medicare beneficiaries. CMS penalties for noncompliance include premium refunds, civil monetary penalties, prohibiting a company from continuing to market and/or enroll members in the company’s Medicare products, exclusion from participation in federally funded healthcare programs and other sanctions. In July 2017 CMS issued a civil monetary penalty against one of the Company’s subsidiaries for non-compliance with a contractual standard outlined in its Part D contract. In February 2018 CMS issued civil monetary penalties against this subsidiary for deficiencies cited as a result of CMS audits conducted in the 2nd and 3rd quarters of 2017. These penalties do not have a material impact on the Company nor its Part D business. The Company is also subcontractor to health plans that are MAOs and PDPs. In the Company’s capacity as a subcontractor with these health plans, the Company administers benefits to Medicare beneficiaries and is indirectly subject to certain federal laws and regulations as well as contractual requirements pertaining to the operation of this business. If the CMS or a health plan customer determines that the Company has not performed satisfactorily as a subcontractor, CMS or the health plan customer may require the Company to cease these activities or responsibilities under the subcontract. While the Company believes that it provides satisfactory levels of service under its respective subcontracts, the Company can give no assurances that CMS or a health plan will not terminate the Company’s business relationships insofar as they pertain to these services. CMS requires Part D Plans to report all price concessions received for PBM services. The applicable CMS guidance requires Part D Plans to contractually require the right to audit their PBMs as well as require full transparency as to manufacturer rebates and administrative fees paid for drugs or services provided in connection with the sponsor’s plan, including the portion of such rebates retained by the PBM. Additionally, CMS requires Part D Plans to ensure through their contractual arrangements with first tier, downstream and related entities (which would include PBMs) that CMS has access to such entities’ books and records pertaining to services performed in connection with Part D Plans. The CMS regulations also suggests that Part D Plans should contractually require their first tier, downstream and related entities to comply with certain elements of the Part D Plan’s compliance program. The Company has not experienced, and does not anticipate, that such disclosure and auditing requirements, to the extent required by its Part D Plan partners, will have a materially adverse effect on the Company’s business. The Company expects CMS and the U.S. Congress to continue to closely scrutinize each component of the Medicare program, modify the terms and requirements of the program and possibly seek to modify private insurers’ role. Therefore, it is not possible to predict the outcome of any Congressional or regulatory activity, either of which could have a material adverse effect on the Company. Federal Laws and Regulations affecting Procurement. The Company is subject to certain federal laws and regulations in connection with its contracts with the federal government. These laws and regulations affect how the Company conducts business with its federal agency customers and may impose added costs on its business. The Company’s failure to comply with federal procurement laws and regulations could cause it to lose business, incur additional costs and subject it to a variety of civil and criminal penalties and administrative sanctions, including termination of contracts, forfeiture of profits, harm to reputation, suspension of payments, fines, and suspension or debarment from doing business with federal government agencies. The Company’s wholly owned subsidiary, AFSC, conducts business with federal agency customers and federal contractors to such agencies. The Company is currently in the process of conducting an investigation into matters relating to compliance by AFSC with Small Business Administration (“SBA”) regulations and other federal laws applicable to government contractors, and the Company intends to make its findings available to the SBA during and upon concluding the investigation. The results of this investigation may give rise to contingencies, if any, that could require us to record balance sheet liabilities or accrue expenses, the amounts of which we are not able to currently estimate. For 2017 AFSC’s total revenue comprised approximately 3% of the total revenues of the Company. The Company also provides services to various state Medicaid programs. Services procurement related to Medicaid programs is governed in part by federal regulations because the federal government provides a substantial amount of funding for the services. The Company’s state customers risk loss of federal funding if the Company is not in compliance with federal regulations. The Company’s non‑compliance may also lead to unanticipated, negative financial consequences including corrective action plans or contract default risks. FDA Regulation. The U.S. Food and Drug Administration (“FDA”) generally has authority to regulate drug promotional activities that are performed “by or on behalf of” a drug manufacturer. The Company provides certain consulting and related services to drug manufacturers and there can be no assurance that the FDA will not attempt to assert jurisdiction over certain aspects of the Company’s activities. The impact of future FDA regulation could materially adversely affect the Company’s business, results of operations, financial condition or cash flows. State PBM Regulation. States continue to introduce broad legislation to regulate PBM activities. This legislation encompasses some of the services offered by the Company’s PBM business. Legislation in this area is varied and encompasses licensing, audit provisions, network access, recoupment of funds, submission of claims data to state all payor claims databases, potential fiduciary duties, pass through of cost savings and disclosure obligations, including the disclosure of information regarding the company’s maximum allowable cost pricing with pharmacies. In some circumstances, claims or inquiries against PBMs have been asserted under state consumer protection laws, which exist in most states. The Company has obtained licenses as necessary to support current business and future opportunities. The various state laws do not appear to have a material adverse effect on the Company’s pharmaceutical management business. However, the Company can give no assurance that these and other states will not enact legislation with more adverse consequences in the near future; nor can the Company be certain that future regulations or interpretations of existing laws will not adversely affect its business. State Legislation Affecting Plan or Benefit Design. Some states have enacted legislation that prohibits certain types of managed care plan sponsors from implementing certain restrictive formulary and network design features, and many states have legislation regulating various aspects of managed care plans, including provisions relating to pharmacy benefits. Other states mandate coverage of certain benefits or conditions and require health plan coverage of specific drugs, if deemed medically necessary by the prescribing physician. Such legislation does not generally apply to the Company directly, but may apply to certain clients of the Company, such as HMOs and health insurers. These types of laws would generally have an adverse effect on the ability of a PBM to reduce cost for its plan sponsor customers. Prompt Pay Laws. Under Medicare Part D and some state laws, the Company or customer may be required to pay network pharmacies within certain time periods and/or by electronic transfer instead of by check. The shorter time periods may negatively impact our cash flow. We cannot predict whether additional states will enact some form of prompt pay legislation. Legislation and Regulation Affecting Drug Prices. Specialty pharmaceutical manufacturers generally report various price metrics to the federal government, including “average sales price” (“ASP”), “average manufacturer price” (“AMP”) and “best price” (“BP”). The Company does not calculate these price metrics, but the Company notes that the ASP, AMP and BP methodologies may create incentives for some drug manufacturers to reduce the levels of discounts or rebates available to purchasers, including the Company, or their clients with respect to specialty drugs. Any changes in the guidance affecting pharmaceutical manufacturer price metric calculations could materially adversely affect the Company’s business. Additionally, most of the Company’s pharmacy benefit management and dispensing contracts with its customers use “average wholesale price” (“AWP”) as a benchmark for establishing pricing. At least one major third party publisher of AWP pricing data has ceased to publish such data in the past few years, and there can be no guarantee that AWP will continue to be an available pricing metric in the future. The discontinuance of AWP reporting by one data source has not had a material adverse effect on the Company’s results of operations and the Company expects that were AWP data to no longer be available, other equitable pricing measures would be available to avoid a material adverse impact on the Company’s business. Separately, on a monthly basis CMS publishes the National Average Drug Acquisition Cost (“NADAC”), a data set that purports to provide the average acquisition cost of retail drugs based on a nationwide voluntary survey of retail pharmacies. At this time, the Company does not anticipate that NADAC will materially adversely impact its operations, but it is too early to speculate what impact, if any, such a reimbursement shift might have in pharmacy reimbursement and/or costs in the future. Regulations Affecting the Company’s Pharmacies. The Company owns five pharmacies that provide services primarily to members of certain of the Company’s health plan customers. The activities undertaken by the Company’s pharmacies subject the pharmacies to state and federal statutes and regulations governing, among other things, the licensure and operation of mail order and nonresident pharmacies, repackaging of drug products, stocking of prescription drug products and dispensing of prescription drug products, including controlled substances. The Company’s pharmacy facilities are located in Florida, Utah and New York and are duly licensed to conduct business in those states. Many states, however, require out‑of‑state mail order pharmacies to register with or be licensed by the state board of pharmacy or similar governing body when pharmaceuticals are delivered by mail into the state, and some states require that an out‑of‑state pharmacy employ a pharmacist that is licensed in the state into which pharmaceuticals are shipped. The Company holds mail order and nonresident pharmacy licenses where required. The Company also maintains Medicare and Medicaid provider licenses where required for the pharmacies to provide services to these plans. In some states the Company is not able to obtain Medicaid licenses to dispense because those states require that the pharmacy have a physical location in the state to participate in the Medicaid network. Regulation of Controlled Substances. The Company’s pharmacies must register with the United States Drug Enforcement Administration (the “DEA”) and individual state controlled substance authorities in order to dispense controlled substances. Federal law requires the Company to comply with the DEA’s security, recordkeeping, inventory control and labeling standards in order to dispense controlled substances. State controlled substance law requires registration and compliance with state pharmacy licensure, registration or permit standards promulgated by the state pharmacy licensing authority and in some states drug database reporting requirements. At December 31, 2017, the Company had approximately 10,700 full‑time and part‑time employees. The Company makes its annual reports on Form 10‑K, quarterly reports on Form 10‑Q, current reports on Form 8‑K, amendments to those reports filed or furnished pursuant to Section 13(a) or 15(d) of the Securities Exchange Act of 1934, and Section 16 filings available, free of charge, on the Company’s website at www.magellanhealth.com as soon as practicable after the Company has electronically filed such material with, or furnished it to, the SEC. The information on the Company’s website is not part of or incorporated by reference in this report on Form 10‑K. Reliance on Customer Contracts—The Company’s inability to renew, extend or replace expiring or terminated contracts could adversely affect the Company’s liquidity, profitability and financial condition. Substantially all of the Company’s net revenue is derived from contracts that may be terminated immediately with cause and many, including some of the Company’s most significant contracts, are terminable without cause by the customer upon notice and the passage of a specified period of time (typically between 60 and 180 days), or upon the occurrence of certain other specified events. The Company’s ten largest customers accounted for approximately 50.0 percent, 43.9 percent and 40.3 percent of the Company’s net revenue in the years ended December 31, 2015, 2016 and 2017, respectively. Loss of all of these contracts or customers would, and loss of any one of these contracts or customers could, materially reduce the Company’s net revenue and have a material adverse effect on the Company’s liquidity, profitability and financial condition. See Note 2—“Summary of Significant Accounting Policies—Significant Customers” to the consolidated financial statements set forth elsewhere herein for a discussion of the Company’s significant customers. Integration of Companies Acquired by Magellan—The Company’s profitability could be adversely affected if the integration of companies acquired by Magellan is not completed in a timely and effective manner. One of the Company’s growth strategies is to make strategic acquisitions which are complementary to its existing operations. After Magellan closes on an acquisition, it must integrate the acquired company into Magellan’s policies, procedures and systems. Failure to effectively integrate an acquired business or the failure of the acquired business to perform as anticipated could result in excessive costs being incurred, a delay in obtaining targeted synergies, decreased customer performance (which could result in contract penalties and/or terminations), increased employee turnover, and lost sales opportunities. Finally, difficulties assimilating acquired operations and services could result in the diversion of capital and management’s attention away from other business issues and opportunities. Changes in the Medical Managed Care Carve‑Out Industry—Certain changes in the business practices of this industry could negatively impact the Company’s resources, profitability and results of operations. A portion of the Company’s Healthcare and Pharmacy Management segments’ net revenues are derived from customers in the medical managed healthcare industry, including managed care companies, health insurers and other health plans. Some types of changes in this industry’s business practices could negatively impact the Company. For example, if the Company’s managed care customers seek to provide services directly to their subscribers, instead of contracting with the Company for such services, the Company could be adversely affected. In this regard, certain of the Company’s major customers in the past have not renewed all or part of their contracts with the Company, and instead provided managed healthcare services directly to their subscribers. In addition, the Company has a significant number of contracts with Blue Cross Blue Shield plans and other regional health plans. Consolidation of the healthcare industry through acquisitions and mergers could potentially result in the loss of contracts for the Company. Any of these changes could reduce the Company’s net revenue, and adversely affect the Company’s profitability and financial condition. Changes in the Contracting Model for Medicaid Contracts—Certain changes in the contracting model used by states for managed healthcare services contracts relating to Medicaid lives could negatively impact the Company’s resources, profitability and results of operations. A portion of the Company’s Healthcare segment net revenue is derived from direct contracts that it has with state or county governments for the provision of services to Medicaid enrollees. Certain states have recently contracted with managed care companies to manage both the behavioral and physical medical care of their Medicaid enrollees. If other governmental entities change the method for contracting for Medicaid business to a fully integrated model, the Company will attempt to subcontract with the managed care organizations to provide behavioral healthcare management for such Medicaid business; however, there is no assurance that the Company would be able to secure such arrangements. Alternatively, the Company may choose to pursue licensure as a health plan to bid on this integrated business. Accordingly, if such a change in the contracting model were to occur, it is possible that the Company could lose current contracted revenues, as well as be unable to bid on potential new business opportunities, thus negatively impacting the Company’s profitability and financial condition. Risk‑Based Products—Because the Company provides services at a fixed fee, if the Company is unable to maintain historical margins, or is unable to accurately predict and control healthcare costs, the Company’s profitability could decline. The Company derives its net revenue primarily from arrangements under which the Company assumes responsibility for costs of treatment in exchange for a fixed fee. The Company refers to such arrangements as “risk‑based contracts” or “risk‑based products,” which include EAP services. These arrangements provided 58.8 percent, 49.1 percent and 49.6 percent of the Company’s net revenue in the years ended December 31, 2015, 2016 and 2017, respectively. The profitability of the Company’s risk contracts could be reduced if the Company is unable to maintain its historical margins. The competitive environment for the Company’s risk products could result in pricing pressures which cause the Company to reduce its rates. In addition, customer demands or expectations as to margin levels could cause the Company to reduce its rates. A reduction in risk rates which are not accompanied by a reduction in services covered or expected underlying care trend could result in a decrease in the Company’s operating margins. Profitability of the Company’s risk contracts could also be reduced if the Company is unable to accurately estimate the rate of service utilization by members or the cost of such services when the Company prices its services. The Company’s assumptions of utilization and costs when the Company prices its services may not ultimately reflect actual utilization rates and costs, many aspects of which are beyond the Company’s control. If the cost of services provided to members under a contract together with the administrative costs exceeds the aggregate fees received by the Company under such contract, the Company will incur a loss on the contract. The Company’s profitability could also be reduced if the Company is required to make adjustments to estimates made in reporting historical financial results regarding cost of care, reflected in the Company’s financial statements as medical claims payable. Medical claims payable includes reserves for incurred but not reported (“IBNR”) claims, which are claims for covered services rendered by the Company’s providers which have not yet been submitted to the Company for payment. The Company estimates and reserves for IBNR claims based on past claims payment experience, including the average interval between the date services are rendered and the date the claims are received and between the date services are rendered and the date claims are paid, enrollment data, utilization statistics, adjudication decisions, authorized healthcare services and other factors. This data is incorporated into contract‑specific reserve models. The estimates for submitted claims and IBNR claims are made on an accrual basis and adjusted in future periods as required. If such risk‑based products are not correctly underwritten, the Company’s profitability and financial condition could be adversely affected. changes in benefit plan design. Some of these factors could impact the ability of the Company to manage and control the medical costs to the extent assumed in the pricing of its services. If the Company’s membership in risk‑based business continues to grow (which is a major focus of the Company’s strategy), the Company’s exposure to potential losses from risk‑based products will also increase. Expansion of Risk‑Based Products—Because the Company intends to continue its expansion into clinically integrated management of special populations eligible for Medicaid and Medicare including individuals with SMI, and other unique high‑cost populations, if the Company is unable to accurately underwrite the healthcare cost risk for this new business and control associated costs, the Company’s profitability could decline. The Company believes that it can leverage its information systems, call center, claims and network infrastructure as well as its financial strength and underwriting expertise to facilitate the development of risk product offerings to states that include behavioral healthcare and physical medical care for their special Medicaid and dual eligible populations, particularly individuals with SMI. As the Company expands into new markets, the Company will incur start‑up costs to develop and grow this business. The Company’s profitability may be negatively impacted until such time that sufficient business is generated to offset these start‑up costs. Furthermore, as the Company expands into new markets, there is an increased risk associated with the underwriting and implementation for this business. Profitability of any such business could be adversely affected if the Company is unable to accurately estimate the rate of service utilization or the cost of such services when the Company prices its services. The Company’s assumptions of utilization and costs when the Company prices its services may not ultimately reflect actual utilization rates and costs, many aspects of which are beyond the Company’s control. If the cost of services provided to members under a contract together with the administrative costs exceeds the aggregate fees received by the Company under such contract, the Company will incur a loss on the contract. The Company may partner with managed care organizations to create joint ventures in some states. Conflicts or disagreements between the Company and any joint venture partner may negatively impact the benefits to be achieved by the relevant joint venture or may ultimately threaten the ability of any such joint venture to continue. The Company is also subject to additional risks and uncertainties because the Company may be dependent upon, and subject to, liability, losses or reputational damage relating to systems, controls and personnel that are not entirely under the Company’s control. Provider Agreements—Failure to maintain or to secure cost‑effective healthcare provider contracts may result in a loss of membership or higher medical costs. The Company’s profitability depends, to an extent, upon the ability to contract favorably with certain healthcare providers. The Company may be unable to enter into agreements with providers in new markets on a timely basis or under favorable terms. If the Company is unable to retain its current provider contracts or enter into new provider contracts timely or on favorable terms, the Company’s profitability could be reduced. The Company cannot provide any assurance that it will be able to continue to renew its existing provider contracts or enter into new contracts. Pharmacy Management—Loss of Relationship with Providers—If we lose our relationship, or our relationship otherwise changes in an unfavorable manner, with one or more key pharmacy providers or if significant changes occur within the pharmacy provider marketplace, or if other issues arise with respect to our pharmacy networks, our business could be adversely affected. Our operations are dependent to a significant extent on our ability to obtain discounts on prescription purchases from retail pharmacies that can be utilized by our clients and their members. Our contracts with retail pharmacies, which are non‑exclusive, are generally terminable by either party on short notice. If one or more of our top pharmacy chains elects to terminate its relationship with us, or if we are only able to continue our relationship on terms less favorable to us, access to retail pharmacies by our clients and their health plan members, and consequently our business, results of operations, financial condition or cash flows could be adversely affected. Pharmacy Management—Loss of Relationship with Vendors—Our specialty pharmacies, pharmacy claims processing, and mail processing are dependent on our relationships with a limited number of vendors and suppliers and the loss of any of these relationships could significantly impact our ability to sustain our financial performance. We acquire a substantial percentage of our specialty pharmacies prescription drug supply from a limited number of suppliers. Our agreements with these suppliers may be short‑term and cancelable by either party without cause with a relatively short time‑frame of prior notice. These agreements may limit our ability to provide services for competing drugs during the term of the agreement and allow the supplier to dispense through channels other than us. Further, certain of these agreements allow pricing and other terms of these relationships to be periodically adjusted for changing market conditions or required service levels. A termination or modification to any of these relationships could have an adverse effect on our business, financial condition and results of operations. An additional risk related to supply is that many products dispensed by our specialty pharmacy business are manufactured with ingredients that are susceptible to supply shortages. If any products we dispense are in short supply for long periods of time, this could result in a material adverse effect on our business, financial condition and results of operations. Further, we source from a limited number of vendors certain aspects of our pharmacy claims and mail processing capabilities. An interruption of service, termination or modification to the terms to any of these agreements may adversely affect our business and financial condition. Pharmacy Management—Loss of Relationship with Manufacturers—If we lose relationships with one or more key pharmaceutical manufacturers or third party rebate administrators or if rebate payments we receive from pharmaceutical manufacturers and rebate processing service providers decline, our business, results of operations, financial condition or cash flows could be adversely affected. rebates decline due to contract branded products losing their patients. Fluctuation in Operating Results—The Company experiences fluctuations in quarterly operating results and, as a consequence, the Company may fail to meet or exceed market expectations, which could cause the Company’s stock price to decline. changes in estimates of contingent consideration. These factors may affect the Company’s quarterly and annual net revenue, expenses and profitability in the future and, accordingly, the Company may fail to meet market expectations, which could cause the Company’s stock price to decline. Dependence on Government Spending—The Company can be adversely affected by changes in federal, state and local healthcare policies, programs, funding and enrollments. A portion of the Company’s net revenues are derived, directly or indirectly, from governmental agencies, including state Medicaid programs. Contract rates vary from state to state, are subject to periodic negotiation and may limit the Company’s ability to maintain or increase rates. The Company is unable to predict the impact on the Company’s operations of future regulations or legislation affecting Medicaid programs, or the healthcare industry in general. Future regulations or legislation may have a material adverse effect on the Company. Moreover, any reduction in government spending for such programs could also have a material adverse effect on the Company (See “Reliance on Customer Contracts”). In addition, the Company’s contracts with federal, state and local governmental agencies, under both direct contract and subcontract arrangements, generally are conditioned upon financial appropriations by one or more governmental agencies, especially in the case of state Medicaid programs. These contracts generally can be terminated or modified by the customer if such appropriations are not made. The Company faces increased risks in this regard as state budgets have come under increasing pressure. Finally, some of the Company’s contracts with federal, state and local governmental agencies, under both direct contract and subcontract arrangements, require the Company to perform additional services if federal, state or local laws or regulations imposed after the contract is signed so require, in exchange for additional compensation, to be negotiated by the parties in good faith. Government and other third‑party payors generally seek to impose lower contract rates and to renegotiate reduced contract rates with service providers in a trend toward cost control. Restrictive Covenants in the Company’s Debt Instruments—Restrictions imposed by the Company’s debt agreements limit the Company’s operating and financial flexibility. These restrictions may adversely affect the Company’s ability to finance the Company’s future operations or capital needs or engage in other business activities that may be in the Company’s interest. On September 22, 2017, the Company completed the public offering of $400.0 million aggregate principal amount of its 4.400% Senior Notes due 2024 (the “Notes”). The Notes are governed by an indenture, dated as of September 22, 2017 (the “Base Indenture”), between the Company, as issuer and U.S. Bank National Association, as trustee, as supplemented by a first supplemental indenture, dated as of September 22, 2017 (the “First Supplemental Indenture” together, with the Base Indenture, the “Indenture”), between the Company, as issuer, and U.S. Bank National Association, as trustee. The Indenture contains certain covenants which restrict the Company’s ability to, among other things, create liens on its and its subsidiaries’ assets; engage in sale and lease-back transactions; and engage in a consolidation, merger or sale of assets. On September 22, 2017, the Company entered into a credit agreement with various lenders that provides for a $400.0 million senior unsecured revolving credit facility and a $350.0 million senior unsecured term loan facility to the Company, as the borrower (the “2017 Credit Agreement”). The 2017 Credit Agreement is scheduled to mature on September 22, 2022.
enter into some types of transactions with affiliates. These restrictions could adversely affect the Company’s ability to finance future operations or capital needs or engage in other business activities that may be in the Company’s interest. The 2017 Credit Agreement also requires the Company to comply with specified financial ratios and tests. Failure to do so, unless waived by the lenders under the 2017 Credit Agreement, pursuant to its terms, would result in an event of default. Required Assurances of Financial Resources—The Company’s liquidity, financial condition, prospects and profitability can be adversely affected by present or future state regulations and contractual requirements that the Company provide financial assurance of the Company’s ability to meet the Company’s obligations. Some of the Company’s contracts and certain state regulations require the Company or certain of the Company’s subsidiaries to maintain specified cash reserves or letters of credit and/or to maintain certain minimum tangible net equity in certain of the Company’s subsidiaries as assurance that the Company has financial resources to meet the Company’s contractual obligations. Many of these state regulations also restrict the investment activity of certain of the Company’s subsidiaries. Some state regulations also restrict the ability of certain of the Company’s subsidiaries to pay dividends to Magellan. Additional state regulations could be promulgated that would increase the cash or other security the Company would be required to maintain. In addition, the Company’s customers may require additional restricted cash or other security with respect to the Company’s obligations under the Company’s contracts, including the Company’s obligation to pay IBNR claims and other medical claims not yet processed and paid. In addition, certain of the Company’s contracts and state regulations limit the profits that the Company may earn on risk‑based business. The Company’s liquidity, financial condition, prospects and profitability could be adversely affected by the effects of such regulations and contractual provisions. See Note 2—“Summary of Significant Accounting Policies—Restricted Assets” to the consolidated financial statements set forth elsewhere herein for a discussion of the Company’s restricted assets. Competition—The competitive environment in the managed healthcare industry may limit the Company’s ability to maintain or increase the Company’s rates, which would limit or adversely affect the Company’s profitability, and any failure in the Company’s ability to respond adequately may adversely affect the Company’s ability to maintain contracts or obtain new contracts. The Company’s business is highly competitive. The Company competes with other healthcare organizations as well as with insurance companies, including HMOs, PPOs, TPAs, IPAs, multi‑disciplinary medical groups, PBMs, specialty pharmacy companies, RBM companies and other specialty healthcare and managed care companies. Many of the Company’s competitors, particularly certain insurance companies, HMOs and PBMs are significantly larger and have greater financial, marketing and other resources than the Company, which can create downward pressure on prices through economies of scale. The entrance or expansion of these larger companies in the managed healthcare industry (including the Company’s customers who have in‑sourced or who may choose to in‑source healthcare services) could increase the competitive pressures the Company faces and could limit the Company’s ability to maintain or increase the Company’s rates. If this happens, the Company’s profitability could be adversely affected. In addition, if the Company does not adequately respond to these competitive pressures, it could cause the Company to not be able to maintain its current contracts or to not be able to obtain new contracts. Possible Impact of Federal Healthcare Reform Law—can significantly impact the Company’s revenues or profitability. The ACA is a comprehensive piece of legislation intended to make significant changes to the healthcare system in the United States. The ACA contains various effective dates extending through 2020. Numerous regulations have been promulgated related to the ACA with hundreds more expected in the future. Significant provisions in the ACA include requiring individuals to purchase health insurance, minimum medical loss ratios for health insurance issuers, significant changes to the Medicare and Medicaid programs and many other changes that affect healthcare insurance and managed care. See “Regulation” above for more information. Therefore, it is uncertain at this time what the financial impact of healthcare reform will be to the Company. The Company cannot predict the effect of this legislation or other legislation that may be adopted by the United States Congress or by the states, and such legislation, if implemented, could have an adverse effect on the Company. The ACA also contains provisions related to fees that impact the Company’s direct public sector contracts and provisions regarding the non‑deductibility of those fees. We believe that our state public sector customers will make rate adjustments to cover the direct costs of these fees and a majority of the impact from non‑deductibility of such fees for federal income tax purposes. There may be some impact due to taxes paid for non‑renewing customers where the timing and amount of recoupment of these additional costs is uncertain. There can be no guarantees regarding this adjustment from our state public sector customers and these taxes and fees may have a material impact on the Company. Possible Impact of Federal Mental Health Parity—can significantly impact the Company’s revenues or profitability. In October 2008, the United States Congress passed the Paul Wellstone and Pete Dominici Mental Health Parity Act of 2008 (“MHPAEA”) establishing parity in financial requirements (e.g. co‑pays, deductibles, etc.) and treatment limitations (e.g., limits on the number of visits) between mental health and substance abuse benefits and medical/surgical benefits for health plan members. This law does not require coverage for mental health or substance abuse disorders but if coverage is provided it must be provided at parity. No specific disorders are mandated for coverage; health plans are able to define mental health and substance abuse to determine what they are going to cover. Under the ACA non‑grandfathered individual and small group plans (both on and off of the exchange) are required to provide mental health and substance use disorder benefits as essential health benefits. These mandated benefits under the ACA must be provided at parity in these plans. Under the ACA, grandfathered individual plans are required to comply with parity if they offer behavioral health benefits. Grandfathered small group plans are exempt from requirements to provide essential health benefits and parity requirements. State mandated benefits laws are not preempted. The law applies to ERISA plans, Medicaid managed care plans and SCHIP plans. On February 2, 2010, the Department of the Treasury, the Department of Labor and the Department of Health and Human Services issued Interim Final Rules interpreting the MHPAEA (“IFR”). The IFR applies to ERISA plans and insured business. A State Medicaid Director Letter was issued in January 2013 discussing applicability of parity to Medicaid managed care plans, SCHIP plans and Alternative Benefit (Benchmark) Plans. It is possible that some states will change their behavioral health plan benefits or management techniques as a result of this letter. On November 13, 2013 the Department of the Treasury, the Department of Labor and the Department of Health and Human Services issued Final Rules on the MHPAEA (“Final Rules”). The IFR included some concepts not included under the statute including the requirement to conduct the parity review at the category level within the plan, introducing the concept of non‑quantitative treatment limitations, and prohibiting separate but equal deductibles. While some of the regulatory requirements in the IFR were not anticipated, the Company believes it is in compliance with the requirements of the IFR. The Company does not anticipate any significant impacts from the Final Rules however it is still reviewing and assessing the Final Rules with customers. The Company’s risk contracts do allow for repricing to occur effective the same date that any legislation/regulation becomes effective if that legislation/regulation is projected to have a material effect on cost of care. Government Regulation—The Company is subject to substantial government regulation and scrutiny, which increase the Company’s costs of doing business and could adversely affect the Company’s profitability. The managed healthcare industry is subject to extensive and evolving federal and state regulation. Such laws and regulations cover, but are not limited to, matters such as licensure, accreditation, government healthcare program participation requirements, information privacy and security, reimbursement for patient services, and Medicare and Medicaid fraud and abuse. The Company’s pharmaceutical management business is also the subject of substantial federal and state governmental regulation and scrutiny. The Company is subject to certain state laws and regulations and federal laws as a result of the Company’s role in management of customers’ employee benefit plans. network pharmacy access laws, including “any willing provider” and “due process” legislation, that affect aspects of our pharmacy network contracts. The imposition of additional licensing and other regulatory requirements may, among other things, increase the Company’s equity requirements, increase the cost of doing business or force significant changes in the Company’s operations to comply with these requirements. The costs associated with compliance with government regulation as discussed above may adversely affect the Company’s financial condition and results of operation. Noncompliance With Regulations—Noncompliance with regulations may have a material adverse effect on the Company’s business, financial condition and results of operations, including from monetary or criminal liabilities and penalties, investigations or regulatory actions, additional compliance requirements, heightened governmental scrutiny, or exclusion from participating in government programs. Extensive laws and regulation are applicable to all of our business operations. Noncompliance by the Company with these laws and regulations may have a material adverse effect on the Company’s business, financial condition and results of operations. Government investigations and allegations have become more frequent concerning possible violations of statutes and regulations by healthcare organizations. The Company also conducts its own investigations into these matters and may choose to self-report its findings to governmental agencies. Violations by the Company with certain laws and regulations may result in it being excluded from participating in government healthcare programs, subject to fines or penalties or required to repay amounts received from the government for previously billed services. In addition, alleged violations may result in litigation or regulatory action. A subsequent legal liability or a significant regulatory action against the Company could have a material adverse effect on the Company’s business, financial condition and results of operations. Moreover, even if the Company ultimately prevails in any litigation, regulatory action or investigation, such litigation, regulatory action or investigation could have a material adverse effect on the Company’s business, financial condition and results of operations. The Company also receives notifications from and engages in discussions with various government agencies concerning the Company’s businesses and operations. As a result of these contacts with regulators, the Company may, as appropriate, be required to implement changes to the Company’s operations, revise the Company’s filings with such agencies and/or seek additional licenses to conduct the Company’s business. The Company’s inability to comply with the various regulatory requirements may have a material adverse effect on the Company’s business. Reference is made to information set forth under “Regulation—Other Federal and State Laws and Regulations” under Item 1 of this Report. Medicare Part D—The Company’s participation in Medicare Part D is subject to government regulation and failure to comply with regulatory requirements could adversely impact the Company’s profitability. There are many uncertainties about the financial and regulatory risks of participating in the Medicare Part D program, and we can give no assurance these risks will not materially adversely impact the Company’s results. Certain of the Company’s subsidiaries have been approved by CMS to offer Medicare Part D prescription drug plans to individual beneficiaries and employer groups. Such subsidiaries are required to comply with Medicare Part D laws and regulations and, because CMS requires that Medicare Part D sponsors be licensed as risk‑bearing entities, also with applicable state laws and regulations regarding the business of insurance. The Company also provides services in support of our clients’ Medicare Part D plans and must be able to deliver such services in a manner that complies with applicable regulatory requirements. We have made substantial investments in both human resources and the technology required to administer Medicare Part D benefits. The adoption of new or more complex regulatory requirements or changes in the interpretation of existing regulatory requirements associated with Medicare Part D may require us to incur significant costs or otherwise impact our ability to earn a profit on such business. In addition, the Company’s receipt of federal funds made available through the Medicare Part D program is subject to compliance with the laws and regulations governing the federal government’s payment for healthcare goods and services, including the federal anti‑kickback law and false claims acts. If we fail to comply materially with applicable regulatory or contractual requirements, whether identified through CMS or other government audits, client audits, or otherwise, we may be subject to certain sanctions, penalties, or other remedies, including, but not limited to, suspension of marketing or enrollment activities, restrictions on expanding our service area, civil monetary penalties or other monetary amounts, termination of our contract(s) with CMS or Part D clients, and exclusion from federal healthcare programs. The Company faces risks related to unauthorized disclosure of sensitive or confidential member and other information. As part of its normal operations, the Company collects, processes and retains confidential member information making the Company subject to various federal and state laws and rules regarding the use and disclosure of confidential member information, including HIPAA. The Company also maintains other confidential information related to its business and operations. Despite appropriate security measures, the Company may be vulnerable to security breaches, acts of vandalism, computer viruses, misplaced or lost data, programming and/or human errors or other similar events. Noncompliance with any privacy or security laws and regulations or any security breach, whether by the Company or by its vendors, could result in enforcement actions, material fines and penalties and could also subject the Company to litigation. Cyber‑Security—The Company faces risks related to a breach or failure in our operational security systems or infrastructure, or those of third parties with which we do business. Our business requires us to securely store, process and transmit confidential, proprietary and other information in our operations. Security breaches may arise from computer hackers penetrating our systems to obtain personal information for financial gain, attempting to cause harm to our operations, or intending to obtain competitive information. Our systems are also subject to the attack of viruses, worms, and other malicious software programs. We maintain a comprehensive system of preventive and detective controls through our security programs; however, our prevention and detection controls may not prevent or identify all such attacks. The costs to update our security protocols to mitigate a security breach could be significant. A breach or failure in our operational security systems may result in loss of data or an unauthorized disclosure of sensitive or confidential member or employee information and could result in significant penalties or fines, litigation, loss of customers, or significant damage to our reputation and business, which could adversely impact the Company’s financial condition and results of operations. The Company faces additional regulatory risks associated with its Pharmacy Management segment which could subject it to additional regulatory scrutiny and liability and which could adversely affect the profitability of the Pharmacy Management segment in the future. Various aspects of the Company’s Pharmacy Management segment are governed by federal and state laws and regulations. Pharmaceutical management services are provided by the Company to Medicaid and Medicare plans as well as commercial insurance plans. There has been enhanced scrutiny on federal programs and the Company must remain vigilant in ensuring compliance with the requirements of these programs. In addition, there are provisions of the ACA which may impact the Company’s business. For example, the ACA imposes transparency requirements on PBMs. PBMs have also increasingly become the target of federal and state litigation over alleged practices relating to prescription drug switching, soliciting, and receiving unlawful remuneration, handling rebates, and fiduciary duties, among others. Significant sanctions may be imposed for violations of these laws and compliance programs are a significant operational requirement of the Company’s business. There are significant uncertainties involving the application of many of these legal requirements to the Company. Accordingly, the Company may be required to incur additional administrative and compliance expenses in determining the applicable requirements and in adapting its compliance practices, or modifying its business practices, in order to satisfy changing interpretations and regulatory policies. In addition, there are numerous proposed healthcare laws and regulations at the federal and state levels, many of which, if adopted, could adversely affect the Company’s business. See “Regulation” above. Risks Related to Realization of Goodwill and Intangible Assets—The Company’s profitability could be adversely affected if the value of intangible assets is not fully realized. The Company’s total assets at December 31, 2017 reflect goodwill of approximately $1.0 billion, representing approximately 34.0 percent of total assets. The Company completed its annual impairment analysis of goodwill as of October 1, 2017, noting that no impairment was identified. At December 31, 2017, identifiable intangible assets (customer lists, contracts, provider networks and trade names) totaled approximately $268.3 million. Intangible assets are generally amortized over their estimated useful lives, which range from approximately one to eighteen years. The amortization periods used may differ from those used by other entities. In addition, the Company may be required to shorten the amortization period for intangible assets in future periods based on changes in the Company’s business. There can be no assurance that such goodwill or intangible assets will be realizable. The Company evaluates, on a regular basis, whether for any reason the carrying value of the Company’s intangible assets and other long‑lived assets may no longer be completely recoverable, in which case a charge to earnings for impairment losses could become necessary. When events or changes in circumstances occur that indicate the carrying amount of long‑lived assets may not be recoverable, the Company assesses the recoverability of long‑lived assets other than goodwill by determining whether the carrying value of such assets will be recovered through the future cash flows expected from the use of the asset and its eventual disposition. Any event or change in circumstances leading to a future determination requiring write‑off of a significant portion of unamortized intangible assets or goodwill would adversely affect the Company’s profitability. Claims for Professional Liability—Pending or future actions or claims for professional liability (including any associated judgments, settlements, legal fees and other costs) could require the Company to make significant cash expenditures and consume significant management time and resources, which could have a material adverse effect on the Company’s profitability and financial condition. The Company’s operating activities entail significant risks of liability. In recent years, participants in the healthcare industry generally, as well as the managed healthcare industry, have become subject to an increasing number of lawsuits. From time to time, the Company is subject to various actions and claims of professional liability alleging negligence in performing utilization review and other managed healthcare activities, as well as for the acts or omissions of the Company’s employees, including employed physicians and other clinicians, network providers, pharmacists, or others. In the normal course of business, the Company receives reports relating to deaths and other serious incidents involving patients whose care is being managed by the Company. Such incidents occasionally give rise to malpractice, professional negligence and other related actions and claims against the Company, the Company’s employees or the Company’s network providers. The Company is also subject to actions and claims for the costs of services for which payment was denied. Many of these actions and claims seek substantial damages and require the Company to incur significant fees and costs related to the Company’s defense and consume significant management time and resources. While the Company maintains professional liability insurance, there can be no assurance that future actions or claims for professional liability (including any judgments, settlements or costs associated therewith) will not have a material adverse effect on the Company’s profitability and financial condition. Professional Liability and Other Insurance—Claims brought against the Company that exceed the scope of the Company’s liability coverage or denial of coverage could materially and adversely affect the Company’s profitability and financial condition. The Company maintains a program of insurance coverage against a broad range of risks in the Company’s business. As part of this program of insurance, the Company carries professional liability insurance, subject to certain deductibles and self‑insured retentions. The Company also is sometimes required by customer contracts to post surety bonds with respect to the Company’s potential liability on professional responsibility claims that may be asserted in connection with services the Company provides. As of December 31, 2017, the Company had approximately $67.7 million of such bonds outstanding. The Company’s insurance may not be sufficient to cover any judgments, settlements or costs relating to present or future claims, suits or complaints. Upon expiration of the Company’s insurance policies, sufficient insurance may not be available on favorable terms, if at all. To the extent the Company’s customers are entitled to indemnification under their contracts with the Company relating to liabilities they incur arising from the operation of the Company’s programs, such indemnification may not be covered under the Company’s insurance policies. To the extent that certain actions and claims seek punitive and compensatory damages arising from the Company’s alleged intentional misconduct, such damages, if awarded, may not be covered, in whole or in part, by the Company’s insurance policies. If the Company is unable to secure adequate insurance in the future, or if the insurance the Company carries is not sufficient to cover any judgments, settlements or costs relating to any present or future actions or claims, such judgments, settlements or costs may have a material adverse effect on the Company’s profitability and financial condition. If the Company is unable to obtain needed surety bonds in adequate amounts or make alternative arrangements to satisfy the requirements for such bonds, the Company may no longer be able to operate in those states, which would have a material adverse effect on the Company. Class Action Suits and Other Legal Proceedings—The Company is subject to class action and other lawsuits that could result in material liabilities to the Company or cause the Company to incur material costs, to change the Company’s operating procedures in ways that increase costs or to comply with additional regulatory requirements. Managed healthcare companies and PBM companies have been targeted as defendants in national class action lawsuits regarding their business practices. The Company has in the past been subject to such national class actions as defendants and is also subject to or a party to other class actions, lawsuits and legal proceedings in conducting the Company’s business. In addition, certain of the Company’s customers are parties to pending class action lawsuits regarding the customers’ business practices for which the customers could seek indemnification from the Company. These lawsuits may take years to resolve and cause the Company to incur substantial litigation expense, and the outcomes could have a material adverse effect on the Company’s profitability and financial condition. In addition to potential damage awards, depending upon the outcomes of such cases, these lawsuits may cause or force changes in practices of the Company’s industry and may also cause additional regulation of the industry through new federal or state laws or new applications of existing laws or regulations. Such changes could increase the Company’s operating costs. Negative Publicity—The Company may be subject to negative publicity which may adversely affect the Company’s business, financial position, results of operations or cash flows. From time to time, the managed healthcare industry has received negative publicity. This publicity has led to increased legislation, regulation, review of industry practices and private litigation. These factors may adversely affect the Company’s ability to market our services, require the Company to change its services, or increase the overall regulatory burden under which the Company operates. Any of these factors may increase the costs of doing business and adversely affect the Company’s business, financial position, results of operations or cash flows. Investment Portfolio—The value of the Company’s investments is influenced by varying economic and market conditions, and a decrease in value may result in a loss charged to income. All of the Company’s investments are classified as “available‑for‑sale” and are carried at fair value. The Company’s available‑for‑sale investment securities were $327.9 million and represented 11.1 percent of the Company’s total assets at December 31, 2017. The current economic environment and recent volatility of securities markets increase the difficulty of assessing investment impairment and the same influences tend to increase the risk of potential impairment of these assets. The Company believes it has adequately reviewed its investment securities for impairment and that its investment securities are carried at fair value. However, over time, the economic and market environment may provide additional insight regarding the fair value of certain securities, which could change the Company’s judgment regarding impairment. This could result in realized losses relating to other‑than‑temporary declines being charged against future income. Given the current market conditions and the significant judgments involved, there is a risk that declines in fair value may occur and material other‑than‑temporary impairments may be charged to income in future periods, resulting in realized losses. In addition, if it became necessary for the Company to liquidate its investment portfolio on an accelerated basis, it could have an adverse effect on the Company’s results of operations. Adverse Economic Conditions—Adverse changes in national economic conditions could adversely affect the Company’s business and results of operations. Changes in national economic conditions could adversely affect the Company’s reimbursement from state Medicaid programs in its Healthcare segment. Adverse economic conditions could also adversely affect the Company’s customers in the Healthcare and Pharmacy Management segments resulting in increased pressures on the Company’s operating margins. In addition, economic conditions may result in decreased membership in the Healthcare and Pharmacy Management segments, thereby adversely affecting the revenues to the Company from such customers as well as the Company’s operating profitability. Adverse economic conditions in the debt markets could affect the Company’s ability to refinance the Company’s existing Credit Agreement upon its maturity on acceptable terms, or at all. The Company currently leases approximately 1.1 million square feet of office space comprising 71 offices in 28 states and the District of Columbia with terms expiring between February 28, 2018 and November 30, 2025. The Company’s principal executive offices are located in Scottsdale, Arizona, which lease expires in October 2019. The Company believes that its current facilities are suitable for and adequate to support the level of its present operations. The Company’s operating activities entail significant risks of liability. From time to time, the Company is subject to various actions and claims arising from the acts or omissions of its employees, network providers or other parties. In the normal course of business, the Company receives reports relating to deaths and other serious incidents involving patients whose care is being managed by the Company. Such incidents occasionally give rise to malpractice, professional negligence and other related actions and claims against the Company or its network providers. Many of these actions and claims received by the Company seek substantial damages and therefore require the Company to incur significant fees and costs related to their defense. The Company is also subject to or party to certain class actions and other litigation and claims relating to its operations or business practices. The Company has recorded reserves that, in the opinion of management, are adequate to cover litigation, claims or assessments that have been or may be asserted against the Company, and for which the outcome is probable and reasonably estimable. Management believes that the resolution of such litigation and claims will not have a material adverse effect on the Company’s financial condition or results of operations; however, there can be no assurance in this regard. As of December 31, 2017, there were approximately 236 stockholders of record of the Company’s common stock. The stockholders of record data for common stock does not reflect persons whose stock was held on that date by the Depository Trust Company or other intermediaries. 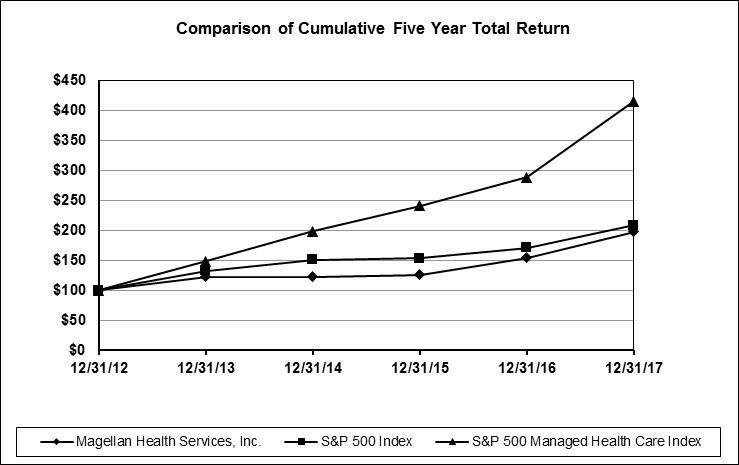 The following graph compares the change in the cumulative total return on the Company’s common stock to (a) the change in the cumulative total return on the stocks included in the Standard & Poor’s (“S&P”) 500 Stock Index and (b) the change in the cumulative total return on the stocks included in the S&P 500 Managed Health Care Index, assuming an investment of $100 made at the close of trading on December 31, 2012, and comparing relative values on December 31, 2013, 2014, 2015, 2016 and 2017. The Company did not pay any dividends during the period reflected in the graph. The common stock price performance shown below should not be viewed as being indicative of future performance. The S&P 500 Managed Health Care Index consists of Aetna, Inc., Anthem, Inc., Centene Corporation, Cigna Corporation, Humana, Inc. and UnitedHealth Group, Inc. The information set forth above under the “Comparison of Cumulative Total Return” does not constitute soliciting material and should not be deemed filed or incorporated by reference into any other of the Company’s filings under the Securities Act or the Exchange Act, except to the extent the filing specifically incorporates such information by reference therein. The Company’s board of directors has previously authorized a series of stock repurchase plans. Stock repurchases for each such plan could be executed through open market repurchases, privately negotiated transactions, accelerated share repurchases or other means. The board of directors authorized management to execute stock repurchase transactions from time to time and in such amounts and via such methods as management deemed appropriate. Each stock repurchase program could be limited or terminated at any time without prior notice. Excludes amounts that could be used to repurchase shares acquired under the Company’s equity incentive plans to satisfy withholding tax obligations of employees and non-employee directors upon the vesting of restricted stock units. The Company made no share repurchases from January 1, 2018 through February 23, 2018. The Company did not declare any dividends during either of the years ended December 31, 2016 or 2017 and does not expect to pay a dividend in 2018. The Company is prohibited from paying dividends on its common stock under the terms of the 2017 Credit Agreement, except in limited circumstances. The declaration and payment of any dividends in the future by the Company will be subject to the sole discretion of the Company’s board of directors and will depend upon many factors, including the Company’s financial condition, earnings, covenants associated with the Company’s 2017 Credit Agreement and any similar future agreement, legal requirements, regulatory constraints and other factors deemed relevant by the Company’s board of directors. Moreover, should the Company pay any dividends in the future, there can be no assurance that the Company will continue to pay such dividends. During the quarter ended December 31, 2017, the Company had no sales of unregistered securities. The following table sets forth selected historical consolidated financial information of the Company as of and for the years ended December 31, 2013, 2014, 2015, 2016 and 2017. Selected consolidated financial information for the years ended December 31, 2015, 2016 and 2017 and as of December 31, 2016 and 2017 presented below, have been derived from, and should be read in conjunction with, the audited consolidated financial statements and the notes thereto included elsewhere herein. Selected consolidated financial information for the years ended December 31, 2013 and 2014 has been derived from the Company’s audited consolidated financial statements not included in this Form 10‑K. The selected financial data set forth below also should be read in conjunction with the Company’s financial statements and accompanying notes and “Management’s Discussion and Analysis of Financial Condition and Results of Operations” appearing elsewhere herein. Includes stock compensation expense of $21.3 million, $40.6 million, $50.4 million, $37.4 million and $39.1 million in 2013, 2014, 2015, 2016 and 2017, respectively. Includes changes in fair value of contingent consideration of $6.2 million, $44.3 million, $(0.1) million and $0.7 million in 2014, 2015, 2016 and 2017, respectively. The following discussion and analysis of the Company’s financial condition and results of operations should be read in conjunction with the Company’s selected financial data and the Company’s financial statements and the accompanying notes included herein. The following discussion may contain “forward‑looking statements” within the meaning of the Securities Act and the Exchange Act. When used in this Form 10‑K, the words “estimate,” “anticipate,” “expect,” “believe,” “should” and similar expressions are intended to be forward‑looking statements. Although the Company believes that its plans, intentions and expectations reflected in such forward‑looking statements are reasonable, it can give no assurance that such plans, intentions or expectations will be achieved. Prospective investors are cautioned that any such forward‑looking statements are not guarantees of future performance and involve risks and uncertainties, and that actual results may differ materially from those contemplated by such forward‑looking statements. Important factors currently known to management that could cause actual results to differ materially from those in forward‑looking statements are set forth under the heading “Risk Factors” in Item 1A and elsewhere in this Form 10‑K. Capitalized or defined terms included in this Item 7 have the meanings set forth in Item 1 of this Form 10‑K. The Company is engaged in the healthcare management business, and is focused on meeting needs in areas of healthcare that are fast growing, highly complex and high cost, with an emphasis on special population management. The Company provides services to health plans and other MCOs, employers, labor unions, various military and governmental agencies, TPAs, consultants and brokers. The Company’s business is divided into three segments, based on the services it provides and/or the customers that it serves. See Item 1—“Business” for more information on the Company’s business segments. Includes revenues of $49.4 million from EAP services provided on a risk basis to health plans and employers with 10.8 million covered lives. Includes revenues of $332.6 million from EAP services provided on a risk basis to federal governmental entities with 3.7 million covered lives. During 2017, Pharmacy Management paid 29.1 million adjusted commercial network claims in its PBM business, 80.7 million adjusted PBA claims and 0.1 million specialty dispensing claims. Adjusted claim totals apply a multiple of three for each 90‑day and traditional mail claim. As of December 31, 2017, Pharmacy Management had a generic dispensing rate of 87.3 percent within its commercial PBM business and served 1.9 million commercial PBM members, 13.1 million members in its medical pharmacy management programs, and 27 states and the District of Columbia in its PBA business. Cost of care is recognized in the period in which members receive managed healthcare services. In addition to actual benefits paid, cost of care in a period also includes the impact of accruals for estimates of medical claims payable. Medical claims payable represents the liability for healthcare claims reported but not yet paid and claims IBNR related to the Company’s managed healthcare businesses. Such liabilities are determined by employing actuarial methods that are commonly used by health insurance actuaries and that meet actuarial standards of practice. Cost of care for the Company’s EAP contracts, which are mainly with the United States federal government, pertain to the costs to employ licensed behavioral health counselors to deliver non-medical counseling for these contracts. The IBNR portion of medical claims payable is estimated based on past claims payment experience for member groups, enrollment data, utilization statistics, authorized healthcare services and other factors. This data is incorporated into contract‑specific actuarial reserve models and is further analyzed to create “completion factors” that represent the average percentage of total incurred claims that have been paid through a given date after being incurred. Factors that affect estimated completion factors include benefit changes, enrollment changes, shifts in product mix, seasonality influences, provider reimbursement changes, changes in claims inventory levels, the speed of claims processing and changes in paid claim levels. Completion factors are applied to claims paid through the financial statement date to estimate the ultimate claim expense incurred for the current period. Actuarial estimates of claim liabilities are then determined by subtracting the actual paid claims from the estimate of the ultimate incurred claims. For the most recent incurred months (generally the most recent two months), the percentage of claims paid for claims incurred in those months is generally low. This makes the completion factor methodology less reliable for such months. Therefore, incurred claims for any month with a completion factor that is less than 70 percent are generally not projected from historical completion and payment patterns; rather they are projected by estimating claims expense based on recent monthly estimated cost incurred per member per month times membership, taking into account seasonality influences, benefit changes and healthcare trend levels, collectively considered to be “trend factors.” For new contracts, the Company estimates IBNR based on underwriting data until it has sufficient data to utilize these methodologies. For any given period, a portion of unpaid medical claims payable could be covered by reinvestment liability (discussed below) and may not impact the Company’s results of operations for such periods. Medical claims payable is offset by customer withholds from capitation payments in situations in which the customer has the contractual requirement to pay providers for care incurred. Favorable development in 2015, 2016 and 2017 was $22.5 million, $10.3 million and $7.5 million, respectively, and was mainly related to lower medical trends and faster claims completion than originally assumed. Actuarial standards of practice require that the claim liabilities be adequate under moderately adverse circumstances. Adverse circumstances are situations in which the actual claims experience could be higher than the otherwise estimated value of such claims. In many situations, the claims paid amount experienced will be less than the estimate that satisfies the actuarial standards of practice. Any prior period favorable cost of care development related to a lack of moderately adverse conditions is excluded from “Cost of Care—Prior Years” adjustments, as a similar provision for moderately adverse conditions is established for current year cost of care liabilities and therefore does not generally impact net income. Approximately 70 percent of IBNR dollars is based on care trend factors. Assumes a change in the care trend factor for any month that a completion factor is not used to estimate incurred claims (which is generally any month that is less than 70 percent complete). Assumes a change in the completion factor for any month for which completion factors are used to estimate IBNR (which is generally any month that is 70 percent or more complete). Due to the existence of risk sharing and reinvestment provisions in certain customer contracts, a change in the estimate for medical claims payable does not necessarily result in an equivalent impact on cost of care. The Company believes that the amount of medical claims payable is adequate to cover its ultimate liability for unpaid claims as of December 31, 2017; however, actual claims payments may differ from established estimates. Other medical liabilities consist primarily of amounts payable to pharmacies for claims that have been adjudicated by the Company but not yet paid. Other medical liabilities also include “reinvestment” payables under certain managed healthcare contracts with Medicaid customers and “profit share” payables under certain risk‑based contracts. Under a contract with reinvestment features, if the cost of care is less than certain minimum amounts specified in the contract (usually as a percentage of revenue), the Company is required to “reinvest” such difference in behavioral healthcare programs when and as specified by the customer or to pay the difference to the customer for their use in funding such programs. Under a contract with profit share provisions, if the cost of care is below certain specified levels, the Company will “share” the cost savings with the customer at the percentages set forth in the contract. In addition, certain contracts include provisions to provide the Company additional funding if the cost of care is above the specified levels. The Company is required to test its goodwill for impairment on at least an annual basis. The Company has selected October 1 as the date of its annual impairment test. The goodwill impairment test is a two‑step process that requires management to make judgments in determining what assumptions to use in the calculation. The first step of the process consists of estimating the fair value of each reporting unit with goodwill based on various valuation techniques, with the primary technique being a discounted cash flow analysis, which requires the input of various assumptions with respect to revenues, operating margins, growth rates and discount rates. The estimated fair value for each reporting unit is compared to the carrying value of the reporting unit, which includes goodwill. If the estimated fair value is less than the carrying value, a second step is performed to compute the amount of the impairment by determining an “implied fair value” of goodwill. The determination of a reporting unit’s “implied fair value” of goodwill requires the Company to allocate the estimated fair value of the reporting unit to the assets and liabilities of the reporting unit. Any unallocated fair value represents the “implied fair value” of goodwill, which is compared to its corresponding carrying value. Goodwill is tested for impairment at a level referred to as a reporting unit, with the Company’s reporting units with goodwill as of December 31, 2017 comprised of Commercial, Government and Pharmacy Management. The fair value of the Commercial (a component of the Healthcare segment), Government (a component of the Healthcare segment) and Pharmacy Management reporting units were determined using a discounted cash flow method. This method involves estimating the present value of estimated future cash flows utilizing a risk adjusted discount rate. Key assumptions for this method include cash flow projections, terminal growth rates and discount rates. The Company estimates income taxes for each of the jurisdictions in which it operates. This process involves determining both permanent and temporary differences resulting from differing treatment for tax and book purposes. Deferred tax assets and/or liabilities are determined by multiplying the temporary differences between the financial reporting and tax reporting bases for assets and liabilities by the enacted tax rates expected to be in effect when such differences are recovered or settled. The Company then assesses the likelihood that the deferred tax assets will be recovered from the reversal of temporary differences, the implementation of feasible and prudent tax planning strategies, and future taxable income. To the extent the Company cannot conclude that recovery is more likely than not, it establishes a valuation allowance. The effect of a change in tax rates on deferred taxes is recognized in income in the period that includes the enactment date. Determination of the amount of deferred tax assets considered realizable requires significant judgment and estimation regarding the forecasts of future taxable income which are consistent with the plans and estimates the Company uses to manage the underlying businesses. Although consideration is also given to potential tax planning strategies which might be available to improve the realization of deferred tax assets, none were identified which were both prudent and reasonable. Future changes in the estimated realizable portion of deferred tax assets could materially affect the Company’s financial condition and results of operations. On December 22, 2017, the President of the United States signed into law the “Tax Cuts and Jobs Act” (the “Tax Act”). The legislation includes a number of changes to existing U.S. tax laws that impact the Company, most notably a reduction of the U.S. corporate income tax rate from 35 percent to 21 percent, effective January 1, 2018. The legislation also provides for the acceleration of depreciation on certain assets placed in service after September 27, 2017, as well as prospective changes beginning in 2018, including additional limitations on the deduction of executive compensation. The SEC staff issued Staff Accounting Bulletin No. 118 (“SAB 118”) on December 22, 2017 to address the application of U.S. GAAP in situations when a registrant does not have the necessary information available, prepared, or analyzed (including computations) in reasonable detail to complete the accounting for certain income tax effects of the Tax Act. SAB 118 allows registrants to determine a reasonable estimate to be included as provisional amounts and provides a measurement period by which the accounting must be completed. The measurement period ends when a registrant has obtained, prepared, and analyzed the information that was needed in order to complete the accounting requirements under ASC Topic 740 but under no circumstances is the measurement period to extend beyond one year from the enactment date (i.e. December 22, 2018). The Company has recognized the provisional tax impacts related to the re-measurement of deferred tax assets and liabilities and included these amounts in its consolidated financial statements for the year ended December 31, 2017. The Company will continue to analyze the Tax Act and additional technical and interpretive guidance on the Tax Act from the government and will complete its accounting no later than December 22, 2018. The Company did not identify any items for which a reasonable estimate of the income tax effects of the Tax Act could not be determined as of December 31, 2017. However, the Company has recognized the provisional tax impacts related to the remeasurement of deferred tax assets and liabilities and included these amounts in its consolidated financial statements for the year ended December 31, 2017. The ultimate impact may differ from these provisional amounts, possibly materially, due to, among other things, additional analysis, changes in interpretations and assumptions the Company has made, additional regulatory guidance that may be issued, and actions the Company may take as a result of the Tax Act. Additionally, any changes to the tax basis for temporary differences between the estimates in these statements and the 2017 federal return filed by the Company will result in a corresponding adjustment to the remeasurement of deferred taxes as of the enactment date of the Tax Act. Any such adjustments will be recorded to tax expense in the quarter of 2018 when the analysis is complete. The tax benefit from an uncertain tax position is recognized when it is more likely than not that, based on the technical merits, the position will be sustained by the taxing authorities upon examination, including resolution of related appeals or litigation processes. Significant judgment is required in determining the Company’s uncertain tax positions. Accruals for uncertain tax positions are established using the Company’s best judgment and adjustments are made, as warranted, due to changing facts and circumstances. The ultimate resolution of a disputed tax position following an examination by a taxing authority could result in a payment that is materially different from that accrued by the Company. The accounting policies of the Company’s segments are the same as those described in Note 1—“General.” The Company evaluates performance of its segments based on profit or loss from operations before stock compensation expense, depreciation and amortization, interest expense, interest and other income, changes in the fair value of contingent consideration recorded in relation to acquisitions, gain on sale of assets, special charges or benefits, and income taxes (“Segment Profit”). Management uses Segment Profit information for internal reporting and control purposes and considers it important in making decisions regarding the allocation of capital and other resources, risk assessment and employee compensation, among other matters. Healthcare subcontracts with Pharmacy Management to provide pharmacy benefits management services for certain of Healthcare’s customers. In addition, Pharmacy Management provides pharmacy benefits management for the Company’s employees covered under its medical plan. As such, revenue, cost of goods sold and direct service costs and other related to these arrangements are eliminated. Stock compensation expense, changes in the fair value of contingent consideration recorded in relation to the acquisitions and impairment of intangible assets are included in direct service costs and other operating expenses; however, these amounts are excluded from the computation of Segment Profit. The non‑controlling interest portion of AlphaCare’s segment profit (loss) is excluded from the computation of Segment Profit. Net revenue related to Healthcare increased by 20.6 percent or $546.6 million from 2016 to 2017. The increase in revenue is mainly due to higher membership and net favorable rate changes of $220.5 million, contracts implemented after (or during) 2016 of $210.8 million, revenue for Senior Whole Health acquired on October 31, 2017 of $186.6 million, revenue for AFSC acquired on July 1, 2016 of $92.3 million, net retroactive program changes recorded in 2017 of $23.3 million, revenue for TMG acquired February 29, 2016 of $8.5 million, retroactive profit share in 2017 of $2.6 million, customer settlements in 2017 of $2.0 million and retroactive rate adjustments in 2017 of $1.5 million. These increases were partially offset by terminated contracts of $139.9 million, net revenue recorded for the Patient Protection and Affordable Care Act health insurer fee (“HIF”) in 2016 of $44.0 million, program changes of $5.5 million, performance penalty in 2017 of $4.6 million, the revenue impact of net favorable prior period medical claims development recorded in 2017 of $4.1 million, favorable retroactive rate adjustments recorded in 2016 of $3.3 million and other net decreases of $0.1 million.